Although Putin has not formally endorsed Trump, this mural in Lithuania has gone viral, with its painter saying that "they both have huge egos, and it’s amusing to see they are getting along well." Photo via Time. 2016 has proven to be an election cycle where most endorsements have been ineffective, but there is a special kind of endorsement that makes waves when announced, but then tends to fade as time goes on: leaders of other countries. US elections have attracted the attention of foreign leaders (some more savory than others) for a while now, so this trend is not new. With the recent news that French President Francois Hollande (the socialist president is at a record low 17% approval rating) has endorsed Hillary Clinton, I thought it would be interesting to see some of the endorsements that the remaining presidential candidates have scored from leaders of other countries. These lists are by no means exhaustive, but merely highlight some of the more prominent figures. French President Francois Hollande: this may be welcome news to Bernie Sanders supporters (after all, Hollande is a socialist that actually got elected), although I can’t imagine that the French president is much more popular in America than he is with his own people. French Prime Minister Manuel Valls (who is similarly unpopular) has also endorsed Clinton. Former British Prime Minister Tony Blair: Blair endorsed Hillary several months ago, when he warned Democrats to be wary of the populism that took over his Labour Party with the ascendency of Jeremy Corbyn (who has a strong affinity for terrorists). Italian Prime Minister Matteo Renzi: earlier this year, Renzi assured Americans that he will be able to work with whoever America’s president is, but that as a private Italian citizen he is “rooting” for Clinton. Former Mexican President Vincente Fox: Fox is no fan of Donald Trump, at one point telling an interviewer “I’m not going to pay for the f**king wall, and please don’t take out the f**king full word.” He also tweeted that America needs a leader as “feminine” as Lady Liberty, before ultimately endorsing Lady Liberty. Venezuelan President Nicolás Maduro: when Maduro endorsed Sanders as his “revolutionary friend,” news was breaking that a dozen eggs in Venezuela cost $150 under his socialist rule, and Sanders didn’t have too much to say when asked about it. British Labour Party Leader Jeremy Corbyn: not only is Corbyn the subject of a musical mocking him, he also just lost a vote of no confidence…from his own party, who fear that his fringe lunacy will cost them elections for years down the road. North Korean State Media: Trump has praised authoritarian figures throughout his campaign, so it isn’t much of a surprise that an oped in DPRK slammed “dull” Hillary and praised a “wise” Trump (although given his propensity for lying, that might not be the best way to describe him). Vladimir Putin: Trump has constantly made a big deal about his bromance of sorts with Putin, who returned the favor by calling him “bright and talented,” while stopping short of endorsing him outright. 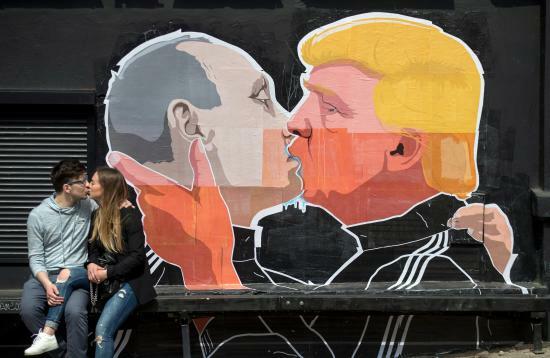 Although Putin has not formally endorsed Trump, this mural in Lithuania has gone viral, with its painter saying that “they both have huge egos, and it’s amusing to see they are getting along well.” Photo via Time. British United Kingdom Independence Party Leader Nigel Farage: it comes as little surprise that Farage, one of the leaders behind Brexit, has endorsed Trump. Trump has seized on Brexit as a way to add fuel to the fire of his campaign. Farage actually spoke at CPAC last year, where he trashed…Republicans (but unlike Trump, at least he showed up). This list is by no means exhaustive, but I think it is interesting to see what leaders have endorsed in this election. Endorsing is always a risk, because if someone makes an endorsement, they might be in the unenviable position of dealing with the candidate they publicly opposed. However, the global order has withstood these endorsements in the past, and 2016 has demonstrated that it is an election that should not be held to normal standards. Is there anyone I should add to the list? Let me know! I intend on periodically updating it as new endorsements occur.